Welcome yourself to luxury living with our Amish Shaker Bookcase Bed. 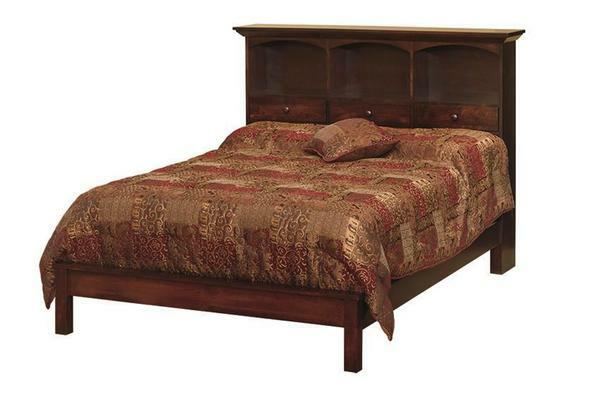 This beautiful heirloom quality bed can be made in a twin, full, queen, or king size bed for your convenience. Get this bookcase bed in cherry wood, oak wood, brown maple wood, or quarter sawn white oak wood and choose a finish color that matches with the rest of your bedroom suite. Please call us at 866-272-6773 if you have any questions about this Amish bookcase bed or if you would like to customize this bed in any way. We look forward to working with you in the near future at DutchCrafters Amish Furniture.